Two Australian miners have been rescued from a gold mine after being trapped deep underground for two weeks. 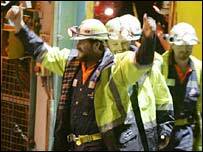 Brant Webb, 37, and Todd Russell, 34, walked out of the lift at the mine in Tasmania and waved to cheering crowds. Australian Prime Minister John Howard said the rescue was a "wonderful demonstration of Australian mateship". He offered condolences to the family of Larry Knight, a third miner who died in the initial accident on 25 April, caused when a tremor dislodged rocks. Mr Knight is due to be buried on Tuesday. His colleagues, Mr Webb and Mr Russell, were trapped in a tiny cage when the tremor struck. Rescuers took a week to bring them out, drilling through hard rock, often by hand. Residents of the town of Beaconsfield gathered at the gates of the mine as news of the rescue began to emerge. The mine's siren sounded and the town's church bell pealed in celebration. Mr Webb and Mr Russell, wearing mining helmets and yellow jackets, walked out of the mine to a large board and shifted their name cards from red to green to signal they had finished their shift. They then waved to the crowds and hugged family and friends before being taken by ambulance to hospital for medical checks. "They're amazing," said mine manager Matthew Gill, who is also a close friend of the two. "I said welcome and we hugged." He said the delicate rescue operation had involved keeping the men horizontal for as long as possible in case they were injured. They were then pulled to safety through a vertical tunnel. "I think the people responsible for the rescue were breaking new ground, but the difficult thing was breaking hard rock," Paul James Reynolds of the Tasmanian emergency services told the BBC. Mr Russell and Mr Webb survived for five days on just one shared cereal bar and by licking water from the rocks around them, before rescuers discovered they were alive by using a thermal imaging camera. The painstaking and dangerous operation to free them then began as rescuers ground through rock described as five times as hard as concrete. The men were given food and water through a small plastic pipe. Rescuers also managed to get iPods to them to help pass the time. The men's plight and the sense of humour they displayed to emergency workers gripped Australia, leading to reports of a media scramble to secure exclusive rights to their story. "The elation is unbelievable, absolutely unbelievable,'' onlooker Diane Alexander told the Sydney Morning Herald newspaper. "The great escape is over," union official Bill Shorten told Nine Network television." "A giant rock of pressure has been taken off these families."